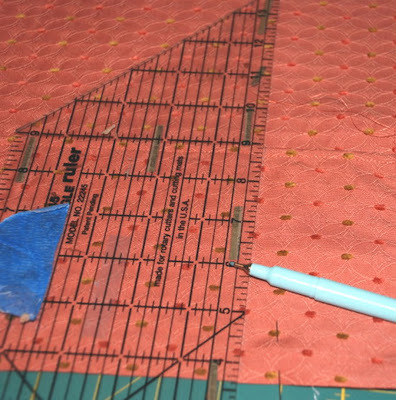 Measure your pillow and add 3/4' to each side. 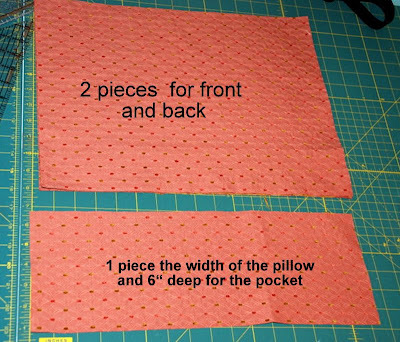 The pillows I bought were 12 x 16, and for this pillow, I cut 2 pieces 12 3/4' x 16 3/4". Sooooo...you have 2 pieces the same size for front and back, and a piece the same length as the pill0w and 6" deep for the pocket. 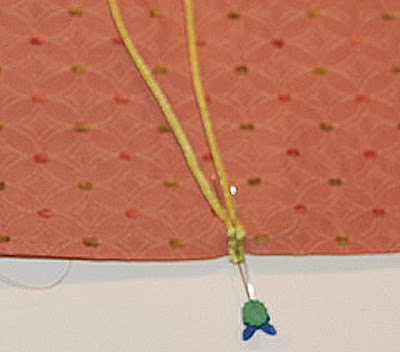 Pin the pocket to the front piece and pin. Mark the pocket with chalk or water-soluble pen. 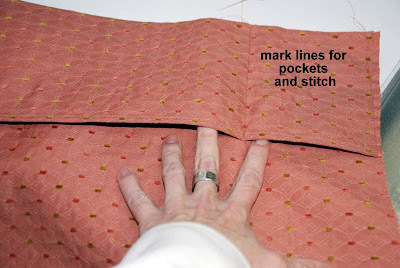 I have made 3 pockets, a small one on each side, a larger one in the middle on mine. 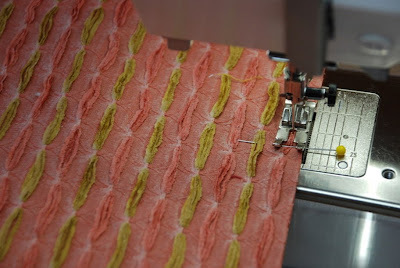 Two lines of stitching. 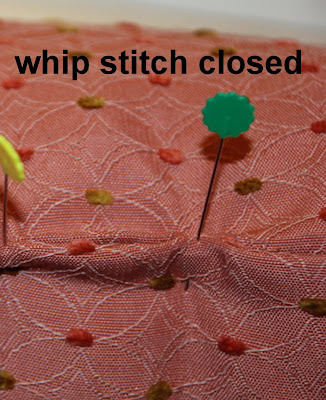 Sew the pocket from the bottom to the top of the pocket and back stitch to make it secure. I've done the page holders differently on every pillow. You can see the variations at the bottom of this post. For this pillow , I decided to start at the bottom instead of the top and to use some rat tail that I already had (no elastic on this one). The rat tail was too bright, so it had to have a strong coffee soak to dull it down. Experiment with how long the ribbon/rat tail should be to hold your book securely, including enough to wrap around the buttons. 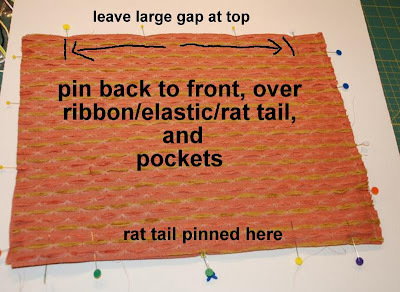 Pin the ribbon/rat tail to the center of the right side, at the bottom of the pocket. 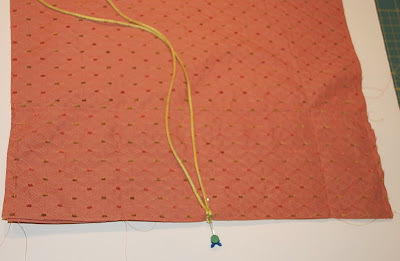 Pin the pillow back to the front, right sides together (you can tuck the ribbon/rat tail in one of the pockets to keep the loose ends out of the way). Leave a large gap at the top to stuff the pillow in! Sew. 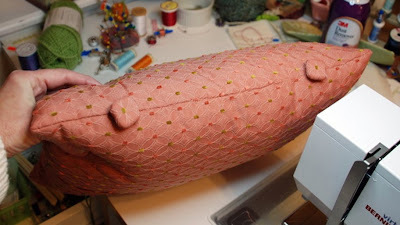 I used a 1/2" seam on this one (but I found the pillow sizes varied slightly...maybe because of the stuffing or brand). I know that isn't what the picture shows, because I just put the fabric under the foot and snapped the shot. Should have paid more attention. Turn the pillow inside out to see how the pillow fits. I've had to go back and make a bigger seam on some pillows. One pillow was just too puffy, and I took some of the stuffing out. 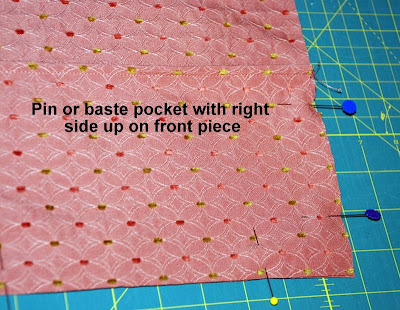 When the fit is satisfactory, trim the corners to reduce bulk, turn again, and stuff the pillow in, pin and slip stitch the insertion opening. 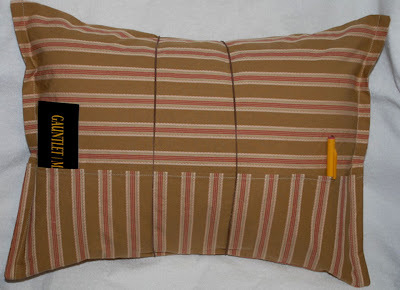 On this one, I covered some buttons with the same material and sewed them to the top of the pillow. On another, I used vintage buttons. When you're ready to read, place your book on the pillow and wrap the rat tail around the buttons to secure the pages, put a book mark, high lighter, pen, or whatever in the pockets,and its good to go. I hope this makes sufficient sense. Such an easy process, but explaining it seems iffy. I have done the solid back on two pillows and the envelope back on two. 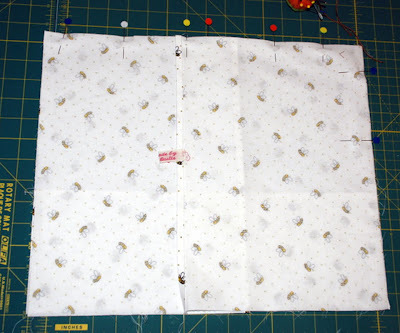 Here is the envelope back being pinned to the front. Instead of one back piece, I cut two pieces long enough to overlap and finished the edges and then pinned it on. You can insert and remove the pillow much more easily. I have a couple of other things I want to try for holding the pages, but I'm a little tired of the darn things right now. If there is anything I can clarify, please let me know, and I'll try. I think it's a marvelous tutorial. I especially like the captions overlayed on the pictures. Don't know if I was just too idiotic or merely lazy to figure it out on my own but now I feel confident I could make one of these. This is very nice. Thanks a lot for posting it. Kay - Thanks. I found it difficult to try to explain, but the process is so very simple. 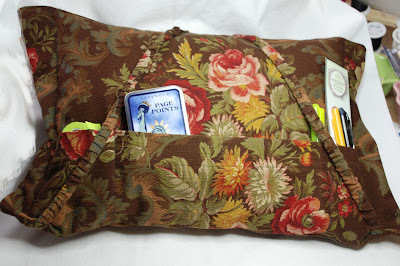 ACey - It is just like making a regular pillow, but adding the pockets and page holders. I think the word verification appears a little low on your blog, and maybe I just don't see it every time. I know I've done it before--written a long comment and clicked away before seeing the word verification. It is really my fault. Francoise - Thanks. I'm enjoying my pillow, especially having my highlighter at the ready! Thank you for this great idea and tutorial. Now I can hold my cookie and my coffee while reading my book. thanks for the tutorial!!! I love giving practical and useful things that I can make! and since all my friends are readers this is great! Rebekah - I hope it is useful; I'm not to good at explanations. kimy - :) Hope it makes sense! Thank you!!!! I have been searching for just such a tutorial for days. I am eager to make these!!!! Any more tips? 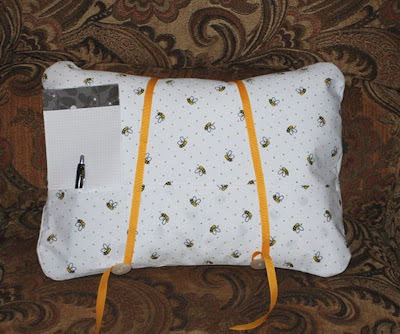 mominmentalmotion - I haven't made any more reading pillows lately, so I don't have any additional tips. However, I find that each time I make one, I try something a little different on the page holders. Haven't found just what want yet! Jen, I'm going to make one of these pillows for a Christmas present. I love the one you made with the covered 1/4" elastic. 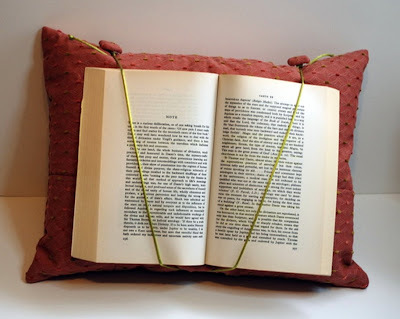 When you use one of these though, wouldn't the straps/elastic to hold it down get in the way of your reading?? ?